“Like Someone in Love” (2012) is about a love triangle, but before writer-director Abbas Kiarostami fully constructs his story around three points, he works magic with just two. The film opens with an establishing wide shot of the interior of a bar at nighttime; about a dozen people crowd the frame, some seated at the edges, some standing in the hazily lit background, others conversing in the center. A woman says “I'm not lying to you” and it takes a minute or so to figure that the voice doesn't belong to any of the people we're watching, but to twenty-ish Akiko (Rin Takanashi), who is seated at a table and speaking to her boyfriend on her cell phone. After this nifty bit of audiovisual sleight of hand, it's not surprising to discover that Akiko is actually lying through her teeth; for an added bit of trickery, note that the first chapter on this Criterion disc is labeled “Cafe Theo” which is the place Akiko claims to be when she is, in fact, at the Bar Rizzo. 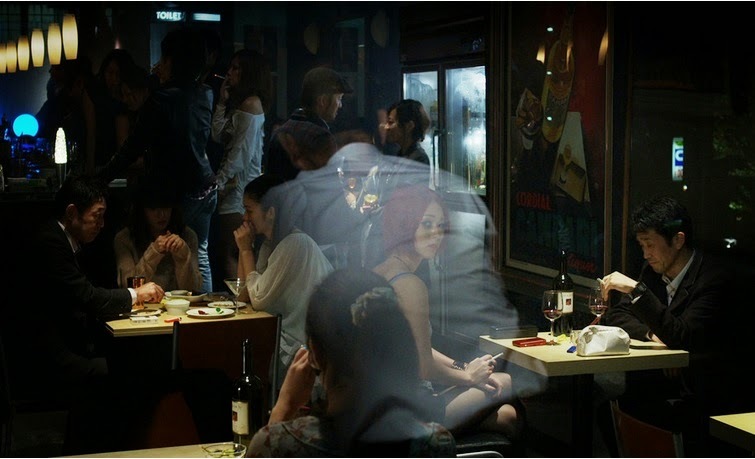 This opening sequence inside the bar lasts approximately fourteen minutes and consists entirely of two set-ups: a medium close-up on Akiko seated near the entrance/exit intercut with that opening wide shot of the bar from her point-of-view. The wide angle serves initially as a master shot, but this remarkably dynamic composition (at one point Akiko enters her own POV shot as she leaves to use the rest room) morphs occasionally into medium close-ups as different people take a seat across the table from Akiko, her perky friend Nagisa (Reiko Mori) and a serious older man (Denden) who turns out to be her pimp. He convinces a reticent and exhausted Akiko to take on a very important job and sends her off in a cab to start building that love triangle, but even before the main action begins, Kiarostami has set an entire world in motion with just a few set-ups. Shot/reverse-shot has been the primary building block of cinema for most of the past century, but every now and then a filmmaker finds a way to make it seem fresh and vigorous. So much energy injected, so many little mysteries introduced, so many personalities briefly sketched out with such simple grammar, and the movie is just starting. Akiko is driven from Tokyo to Yokohama to meet her client for the evening. 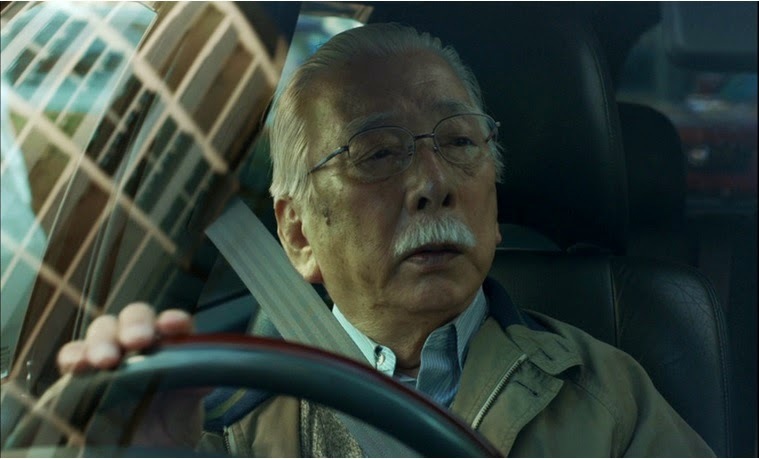 Takashi Watanabe (Tadashi Okuno, a veteran movie extra who never spoke a line on camera before) is sixty years Akiko's senior, but if you think this stoop-shouldered, shuffling former professor is just a dirty old man, well, it's not quite that simple. When Akiko slips off her blouse and then slips into the professor's bed, she clearly wants to make this a straight-forward transaction. Mr. Watanabe, however, had hoped to serve her some tasty shrimp soup and have a nice conversation. Not that he is entirely uninterested in other matters, but a series of sighs suggests that for this aging man of intellect, desire has transformed into regret and resignation, perhaps a memory of what once was. Akiko is described as resembling both his wife and his daughter, but as she glibly states, “Not a day goes by that I'm not told that I look like someone.” How complicated. What exactly is it like to be someone in love? Their first evening together ends with a tasteful cut that leaves several questions unanswered, and by the next day the professor has slipped into a parental role as he drives Akiko back to the city for school. As he waits for her in the car, he encounters the third leg of the triangle, Akiko's boyfriend Noriaki (Ryo Kase). The young man is sincere but volatile, and if the squinting, slightly myopic professor sees Akiko as an obscure object of desire, the immature Noriaki can view her only as a compliant wife-to-be. Neither vision jibes with Akiko's plans, or at least that's our best guess as she reveals virtually nothing. Initially mistaking the professor for Akiko's grandfather (a deception that Mr. Watanabe cannily avoids either confirming or denying), Noriaki treats him kindly to curry favor with the family; later he will erupt, leading to the movie's surprising ending. This is Kiarostami's second movie shot outside of Iran. The Italian-set “Certified Copy” (2010) gleefully turned its actors (and audience members) loose on a rapidly shifting landscape, with apparent strangers gradually transforming into old, embittered lovers. The French-Japanese “Like Someone in Love” isn't quite as enigmatic, but Kiarostami clearly loves to raise questions he has no intention of answering. This was just as true of his Iranian films (see, for example, the blurring of reality and fiction in his 1990 masterpiece “Close-Up”), but he now has the freedom to be more direct in his treatment of romantic and sexual subjects and to portray different kinds of female protagonists. Kiarostami still possesses a remarkable knack for crafting vivid supporting characters from just a few details. Just as Akiko is introduced by only her voice, two other female characters appear as disembodied off-screen presences. Mr. Watanabe's neighbor from the building across the alley calls out to him, and his irritation suggests this is an ongoing intrusion; later she addresses Akiko and manages to insert herself into the story with just a few lines. Even more memorable is Akiko's grandmother, a tangible presence though she is glimpsed only briefly and at a great distance. She leaves a series of messages for Akiko, begging to meet with her granddaughter during her brief trip to Tokyo. She tugs at the heartstrings of every current or former grandchild in the audience with her plaintive, cracked voice with its unmistakable “I'll be dead soon, but don't go out of your way on my account” subtext. Touches like that leave just as much of an impression as the open-ended narrative. “Like Someone in Love” is about a love triangle and elemental desire in all its unstable, radioactive isotopes, but it's every bit as much about a guilt-inducing grandmother, long shots of an enervated Akiko slumping in the back of a cab at night, Mr. Watanabe falling asleep at the wheel of his car as other drivers honk to get his attention, and a tureen of soup that never quite gets eaten. The movie is presented in its original 1.66:1 aspect ratio. It was shot on a RED digital camera, and the high-def image transfers neatly to this 1080p Blu-ray. The image is pretty much flawless and I guess it's getting harder to say that's a bit of a “problem” for those used to the grainier look of 35 mm film. Image detail is razor-sharp throughout, something especially evident in the night scenes that comprise much of the first half of the movie. This is a dual-format release with a single DVD and a single Blu-ray disc. The SD transfer has not been reviewed here. Criterion describes this a 3.0 surround track, though you probably won't be able to tell the difference from a more typical DTS-HD Master Audio 5.1 track. The sound track creates a palpable sense of environment, from the busy noises of the club to the quieter space of Mr. Watanabe's apartment. Of course, the sound track is completely distortion free. Optional English subtitles support the Japanese audio. Aside from a Trailer (2 min. ), the only extra Criterion has included for this recent release is a lengthy Making Of documentary (47 min.) that consists mostly of interviews with Kiarostami discussing the genesis of the project (a story he first conceived over fifteen years ago), his sometimes idiosyncratic way of working with actors, and the advantages of video over 35 mm film. In Iran, Italy, Japan, or any other points abroad, Kiarostami is still a master of the medium like few others. As with “Certified Copy,” the movie only improves on a second viewing. The disc is light on features, but the beautiful high-def transfer and a strong audio mix are more than enough to make this an attractive addition to any library.